I have some very exciting news! 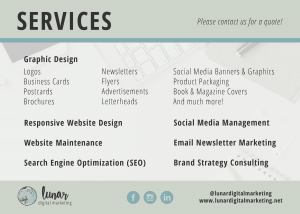 I’m thrilled to announce that I have completely re-branded my business, and now offer new digital marketing services in addition to graphic and web design, including social media management, email marketing, brand strategy consulting, and SEO. Thank you for your support, and a special thanks to Nina Pomeroy Photography for these amazing new headshots! In addition to a new name, logo, look and feel, and email address, we have a new website! Please check it out and get familiar with our new brand. Our new services are listed on the graphic below. Our social media pages have transformed as well. We welcome and appreciate your feedback!